Samsung Galaxy A8 is now official; and it is dubbed to be the thinnest Galaxy device to date with its 5.9-millimeter depth. Check out the rest of the specs of this monster phone. 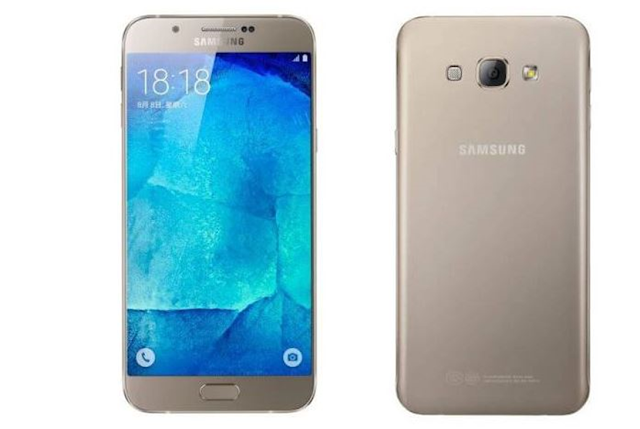 The Samsung Galaxy A8 is now official with the thinnest body depth in a Galaxy device to date. The handset has been enduring multitude of stories before its official announcement; and yesterday marked the point where all the rumours die down with the device's unveiling in China. The Samsung Galaxy A8 is heavily patterned with the latest flagship handset of the Korean outfit, the Galaxy S6. It has all the necessary curves and design philosophy akin to the Galaxy S6 in terms of its front panel. Flipping it over, the Galaxy A8 offers an aluminum construction (just like any other A series handset) instead of a glass finish donned by the S6 duo. As far as the hardware goes, the Samsung Galaxy A8 settles for the upper mid-tier market. It comes with a Qualcomm Snapdragon 615 chipset which packs a cluster of four 1GHz Cortex A53 cores and another set of four 1.5GHz Cortex A53 cores. The chipset is also coupled with a 2GB of RAM for faster app launching and smooth multitasking. This 5.7-incher also gives a choice between 16GB or 32GB for on-board memory. Plus, the Galaxy A8 also comes with a dual SIM capability - one slot is shared by the memory card. This means that you can’t use two SIMs when you want ti use your memory card. In terms of camera, you'll get the same 16MP shooter from the Galaxy S6 with the same f/1.9 aperture; however, the Galaxy A8's module has a reduced pixel size to 1.0 micrometer. This 151-gram smartphone features LTE connectivity, NFC, dual-band WiFi, GPS and BLuetooth 4.1 on board. In contrast to other Galaxy A handsets, the Samsung Galaxy A8 comes with a fingerprint sensor which is a common thing with top-of-the-line phones this year. There's also a beefy 3050 mAh battery to give users a longer mileage on road.